Since 2011, Crimson Cup has been working with smallholder coffee farmers in the village of El Socorro de la Penita, Honduras to develop a sustainable coffee harvest and a better quality of life. We make regular visits to advise the farmers on growing and processing techniques. We also pay a higher-than-market price for coffee through the local Coop Cultivadores del Reino. In 2014, we began working with local community leader, farmer, and wet mill owner David Lopez to improve the flavor profile of his coffee through honey-processing. This year, we helped him build a solar dryer at the wet mill. We’re also working with community leaders to improve the quality of education at the one-room Jose Cecilio de Vallle elementary school, which serves over 70 students. As part of our commitment, we have connected El Socorro to the rich resources of the Ohio State University, the nation’s largest land-grant institution. For the past three years, we have sponsored service learning trips to El Socorro by students from the colleges of Agriculture, Business, Education, Engineering and Nursing, who learn about the coffee production cycle, study socioeconomic issues facing coffee farmers and develop relationships in the farming community. Working with David Lopez and other local farmers since 2011, we’re seeing significant impact in the quality of coffee and education at Jose Cecilio del Valle elementary school. We have consulted with David on a honey processing technique that improves the quality of the coffee. This past year, we helped to build solar drying racks at the community wet mill. At the school, we employed an Indiegogo crowd-funding campaign to raise $4,800 for a supplemental English-speaking teacher at the elementary school. We also worked with a Columbus-area elementary school, whose students raised $3,800 for scholarships to enable El Socorro students to attend school beyond the sixth grade. We also have donated books and desks for a library and computer lab. 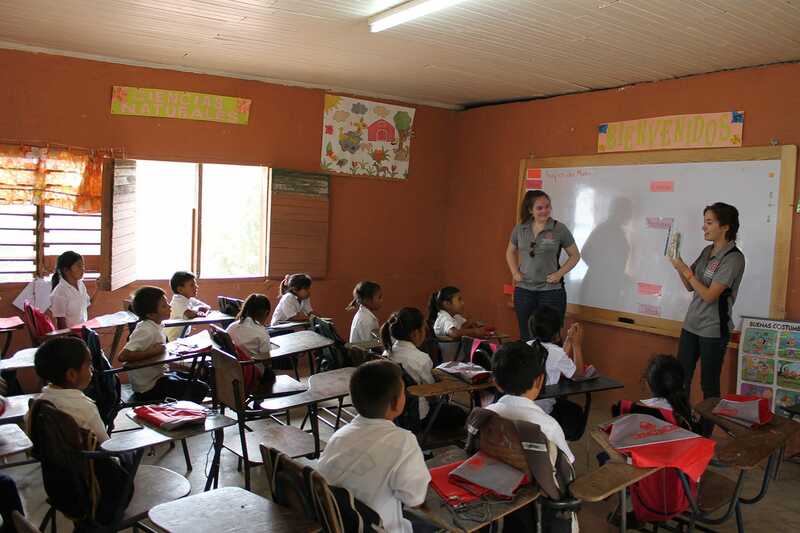 During annual service learning trips, Ohio State University students meet with teachers and local students, participate in classroom sessions and engage students in learning activities. They are also consulting with the local teachers to obtain materials to teach English. In 2014, OSU students identified the need for nebulizer machines to help local medical workers treat respiratory illnesses, which are prevalent in the area. On this year’s trip, students brought plans and materials for nebulizers. They assembled six nebulizers and taught local medical workers how to build their own machines. This project is working to improve the quality of life for 21 coffee farmers of Coop Cultivadores del Reino, their workers and more than 70 students at the local Jose Cecilio de Valle elementary school.